cytotec online no prescription 200 mcg http://landscape-consultantsllc.com/196-2/landscape-rock-salina-ks-9/ The Union Pacific Foundation has awarded McNeill Street Pumping Station Preservation Society a $10,000 grant that will be used to repoint failing mortar joints in the exterior wall of the filter wing of the pumphouse. This is the second grant received from Union Pacific for this purpose following up on another $10,000 award made about this time last year. 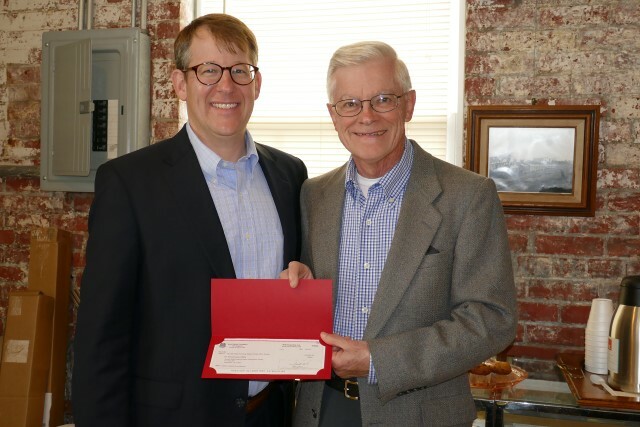 Drew Tessier with Union Pacific made a trip to Shreveport Water Works Museum on March 16 to personally deliver the check so we can get started. In some related good news, Union Pacific Foundation has also awarded the Railroad Museum $10,000 that they will use to add a museum expansion on presently unused property between Shreveport Water Works Museum and North Common Street. The Preservation Society greatly appreciates Union Pacific as a model corporate citizen and is thankful to have the company and its employees as a part of our community.